Mission Statement Our mission is to enhance quality of life for people of the greater Sedona community through our award winning food programs, outstanding exercise and educational activities, compassionate supportive services and by providing a venue for meetings, social, and cultural events. Services and Projects The Center welcomes those who seek the rewards of volunteerism. We provide a variety of social services, classes, and educational venues. We offer a wide slate of classes open to all. SCC offers rental space for your meeting or event. The Sedona Community Center is the place to begin if you would like to volunteer to serve the community in a very rewarding way or would like to come in and join us for our events and/or classes. Description: SCC is a vital member of the greater Sedona community. We offer many opportunities to enjoy coming together with old and new friends alike. We provide a community lunch Monday through Friday, a variety of social services and classes, all of which are open to everyone. SCC has built a variety of on-going events around rental of our Tudor and Flynn rooms. Perhaps you have a meeting, event or activity which could be housed at our handsome facility. We invite you to experience the energy and warmth which is reflective of Sedona’s small town character. The Sedona Community Center is the place to begin. For more information, visit our website at sccsedona.org or call us at 928 282-2834. Description: Mission Statement: Our mission is to enhance the quality of life for people of the greater Sedona community through our award winning food programs, outstanding educational and exercise activities, compassionate supportive services and by providing a venue for meetings, social and cultural events. Description: Meals on Wheels: The Sedona Community Center has been recognized by Meals on Wheels America as one of the elite small town programs in the United States. Meals on Wheels aims to prevent deterioration of health and loss of independence by helpine people remain in their homes with proper nutrition and regular wellness checks. Hot, tasty, nutritious meals are delivered Monday through Friday from 11:00 to 1:00 PM. Bereavement Support: Life After Loss meets each Thursday from 10:30 a.m. to 12:00 p.m. Meeting is in a quite, private setting and is sponsored by Hospice Compassus and the Sedona Community Center. Community Lunch Program: All members of the community are invited to join us in our dining room for a delicious hot meal. Enjoy the friendly atmosphere, meet and make new friends. Lunches are served promptly at noon Monday through Friday. A suggested contribution is $5.00 for seniors and $6.00 for all others. TeleCare Program: A dedicated cadre of volunteers calls homebound seniors for a wellness check and some friendly conversation seven days a week. Educational and Fitness Programs: A wide range of fitness classes are offered Monday through Friday. Join us for SilverSneakers classes, Meditation, Qi-Gong, Wiggle and Giggle, WaterColor for all levels and more. Check out our website at www.sccsedona.org for a current program schedule, as programs may vary through out the year. Description: We would not be able to carry out our core mission without the dedication and caring of our amazing volunteers. It really does "take a village". Each day volunteers deliver Meals on Wheels to homebound seniors, those with disabilities who are unable to shop and cook for themselves, and those who are recovering from surgery. Other volunteers greet and/or serve those who attend our community lunches. Others help in the kitchen, or garden, or during mass mailing events. We also have a team of TeleCare callers who call homebound seniors for a daily wellness check. For a complete list of volunteer opportunities and an application, visit our website at www.sccsedona.org. or call us at 928-282-2834. The Sedona Community Center serves a hot lunch to the community Monday thru Friday. We rely on volunteers to serve the lunch. We are in need of a couple more people willing to fill this need. You can choose 1 day a week, every other week or 1 time a month! It's up to you! It is a just under 2 hour commitment per day. Please call Pam @ 282-2834 if you are interested in helping out. Thank YOU! As you are probably aware, our Meals on Wheels program is the only hot meal delivery program serving the Sedona and VOC area! We are in need of "fill in" Meals on Wheels drivers for the summer as our regular drivers take vacations. It takes up to 6 weeks to get set up to drive, so if you are interested in helping out this summer please call Peggy at the Sedona Community Center right away for information to become part of our awesome team of drivers. 928-282-2834 Thank You! We are so grateful for the generous support of a community member that came forward with the funding for the AED Defibrillator for the Center! The new AED Machine will replace the out-of-date model that no longer can be repaired. So thankful for the 'heart' that may some day help another heart in need. As extra icing on the cake, another Sedona Community Center supporter has contributed additional funds to ensure staff can get the training the need on our need AED machine--thank you! We wish to thank all those who so generously donated turkeys and hams to the Sedona Community Center for our free Christmas Day meal. It was a huge success. We also want to thank all the volunteers who so selflessly gave of their time and energy to prepare, serve, clean up and ensure the event went smoothly. We wouldn't be able to accomplish our mission of enhancing quality of life to those in the greater Sedona area without the wonderful support of you all. Again, many, many thanks to you! Many recipients of our Meals on Wheels food programs also have pets that need food. The Sedona Community Center has a special program that is dedicated to pet health. We need additional funds dedicated to this program so that we can continue to help feed pets in need. Their owners are generally home-bound seniors that are no longer able to shop or cook for themselves and/or their beloved companions. 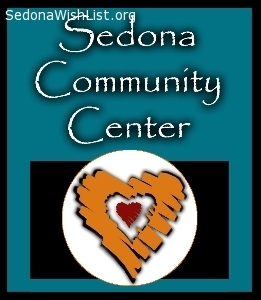 If you are able to donate to this worthy cause, you can donate on-line at www.sccsedona.org or send your checks to the Sedona Community Center at P.O. Box 2894, Sedona AZ 86339 Once again, thank you so very much for your support. Your Sedona Community Center serves a community lunch Monday through Friday weekly at noon. We are looking for volunteers for the following positions. Community Lunch set up volunteers who will set up 3 to 5 round tables with chairs at approximately 11:15 a.m.
Greeters for the community lunches which are served Monday through Friday from 12:00 - 1:00. Greet lunch clients, take their donations and have them sign the guest book. Servers with a food handlers card (involves 1 1/2 hour class) who serve the salad, entree and desert. We do appreciate your support for the Sedona Community Center and our meals programs. If you would like to help us for a day or two a week, call 928 282-2834. Thank you. Thanks to the Sedona Wish List and to those who have stepped up to deliver meals to our Meals On Wheels Programs! We are heartened by the response of those who invest their time and effort to help insure that no senior in the greater Sedona area goes hungry. We greatly appreciate you all! We are requesting donations for our Meals on Wheels Programs. We provide over 6,000 meals per quarter to seniors who are either homebound or unable to shop and cook for themselves. Due to sequestration, and the general slowdown of the economy, we need funds to purchase food, prepare and deliver meals to those in need in the greater Sedona area. We thank you so much for your support of your community and for supporting your neighbors in need. Thank you! Your Sedona Community Center is in need of volunteers to do yard work and clean-up. We especially need those who can offer a half day or so to clear debris, and move miscellaneous items but any time contributed would be gladly accepted. We appreciate your support very much. Thank you! SCC needs donations to help cover food costs for our Meals on Wheels programs. We provide hot, nutritious, healthy lunches to homebound seniors Monday through Friday. $25.00 will feed a hungry senior for a week and $100.00 will feed a senior for about a month. We do appreciate your generosity and support. Thank you! We are so pleased that a benevolent neighbor donated a dozen redwood planters. We are well on our way to enhancing our site to make it more inviting to host your activities. All of us here thank you so much for your support and caring. We have a brand new server for our Congregate Lunch! Thank you Sedona Wish List for sending them our way!